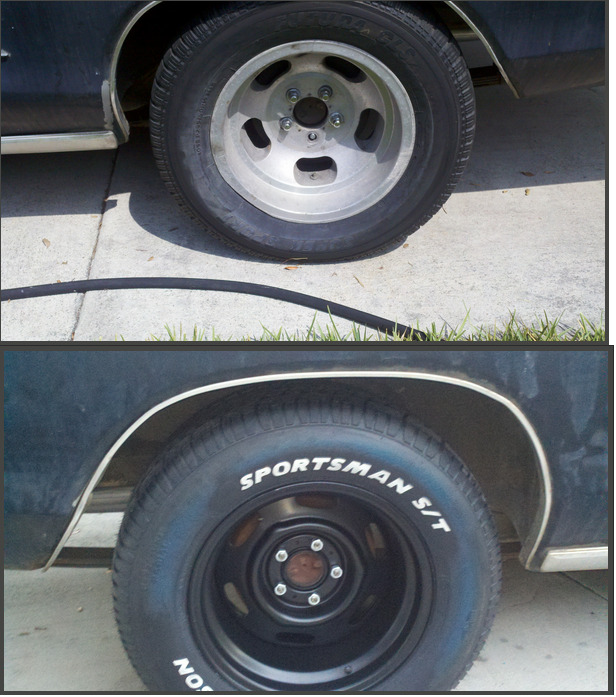 New tires and wheels for the Coronet. Here is a little bit of a before and after. I couldn’t believe how hard it was to find a tire shop that would deal with my new rims and tires. The mom and pop shops straight out told me they were scared of scratching them, and after three shops, I went to Sears. Here’s a before and after from the rear. Actually should be an After and Before, as the after pic is on top. 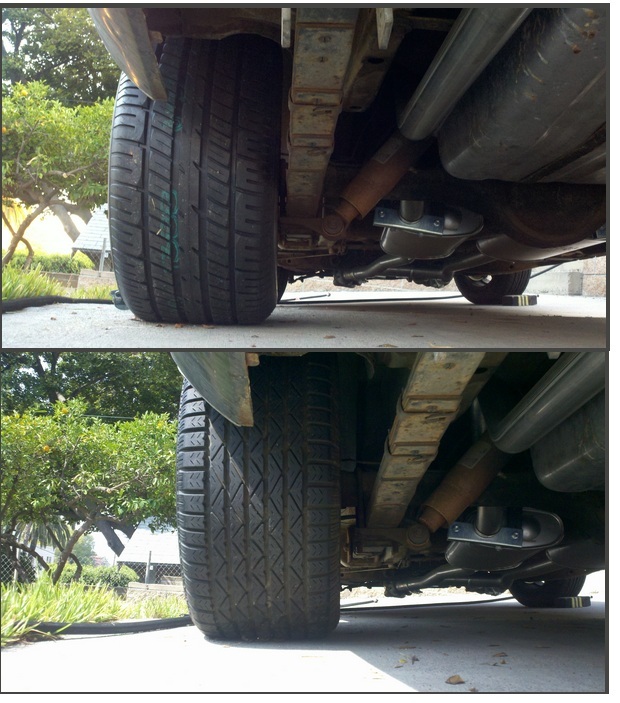 . . anyway, you can see how much beefier the new tires are in general. Big, chunky, and hopefully sticky. You can also see how much closer everything is to the tires. This is a 15×10 inch rim with 5.5 inches of backspacing. The tires are 295/50/15’s. The leaf springs look beat. They’re probably fine, but at this point, I’m just going to get them. No sense in cutting corners now. I’m going to get some extra stiff springs, that add a bit of lift, so I can get rid of my lift shackles and clean it up back there a little bit. Also the rear right tire sounds like it’s rubbing in the fender a bit on harder left turns. Especially considering I want to be able to carry passengers in this car, the springs will need some stiffening. So I’ll be adding some Extra Heavy Duty rear springs soon. Cant get over how awesome the rims look. Need to get the fronts to match, sort out my leaf springs, and then worry about the paint an interior. However, I may need a little break now that shes running solid, as I have a certain Volkswagen that needs to get sold or used in general. I got a parking ticket on it the other day for not moving it, so I think it’s time. 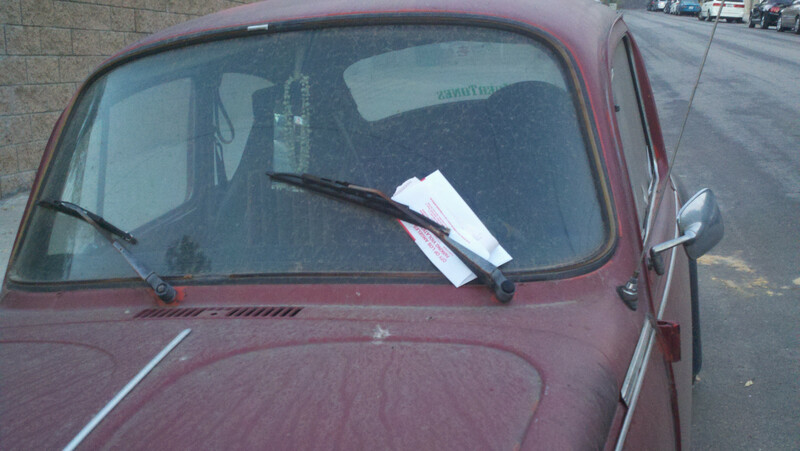 Nothing motivates me like a parking ticket. I’ve never been impounded and I don’t want to start now. Someone at work was nice enough to give me an awesome blast from the past today. Cops EVERYwhere, Ridiculous amounts of black and white LAPD cruisers lining the streets around my job. Then I get into my office, and look out my window toward Canoga. I see the hotel from the news last night, the hotel that President Obama is staying at while he’s in town. Thanks for the traffic Obama! Just in case, I’ll say it, this is a joke. Sarcasm is lost on some people, so I’ll say I’m making a satirical remark about how people blame Obama for everything. Today, I can literally blame my paranoiac copy heavy commute and long lag time to get to work, directly on our President Obama, and I ain’t even mad. Wrigley field is on my bucket list. I’ll probably go in the spring next year, as opposed to during the actual season. It’s easier to get in, and you can take a tour, which I understand you cannot if the cubs are in town. Today the Dodgers are playing there, and we’re winning 1-0 at the moment. Top of the fourth inning, and we’ve got a 30-7 recording our last 37 games. Incredible. I always wait for the all star break before making predictions, but this team is starting to feel like the real deal. The crowd at the stadium has elect crackle of electricity about the, again, and the season is beginning to feel like its winding down for a lot of teams, like the miserable Giants, who at the moment are wallowing in last place. I’m still waiting for my wheels, so I can get to work on that.they should be here Tuesday, will definitely be posting pics of that. Otherwise a pretty mellow weekend. I got to visit Angel City Brewing over the weekend with a friend, and that was pretty awesome. I think it’s pretty lame that they were closing at midnight, on a Friday night if all things, but their beer was good. The atmosphere seems pretty cool, but it was Friday, so it was crowded, and I got out of there pretty early. This coming week should be pretty exciting, so I’m taking it easy this weekend.